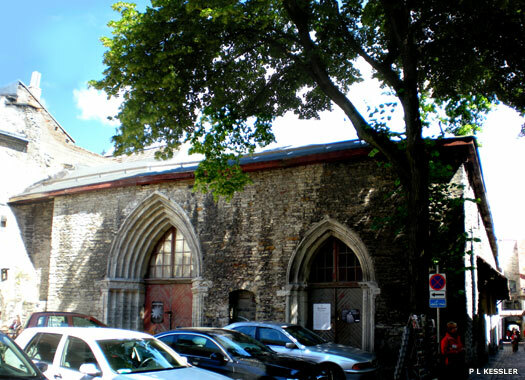 The former Church of St Catherine of Alexandria is on St Catherine's Passage (Katariina käik), between Vene and Müürivahe streets. It was the grandest and southernmost building in the Dominican friary complex which was founded by the Order of the Brothers of the Sword in the second half of the thirteenth century. The church connected directly to the friary garth, and to the monastery storeroom which still exists. The church itself was originally a three-aisled hall church which was influenced by those in Visby, Gotland, in Sweden. 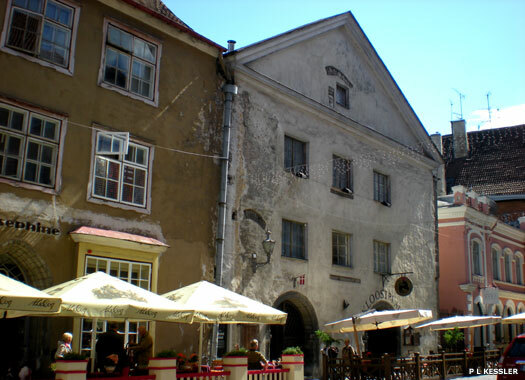 It was probably completed in the mid-fifteenth century, at which point it was the largest church in Tallinn. The fire of 1531 left it in ruins, and it stayed that way for four hundred years, with only the western wall surviving, along with two Gothic portals, and bits of the north and south walls (the latter on the left here). In the mid-nineteenth century the western section of the ruined church was restored, although only to a height of one storey. 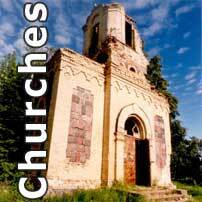 The rest, the tower and the nave which reached a height of perhaps five stories, had been lost to the ravages of time. 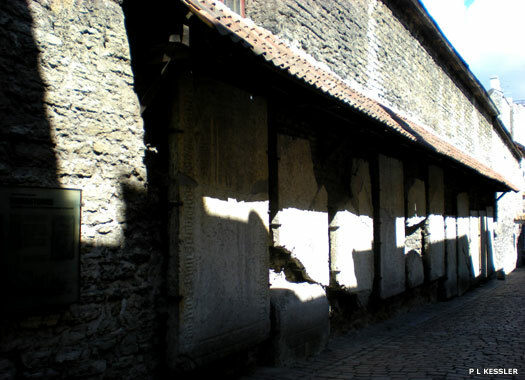 The tombstones along the outer wall of the church, lining St Catherine's Passage, are from the church itself. The earliest dates from 1371 while the most recent is from 1503. In the mid-nineteenth century the western section of the ruined church was restored and the best-preserved tombstones were displayed on the wall, although others had a chequered history, being moved around to be shown off in the houses of the nobility. 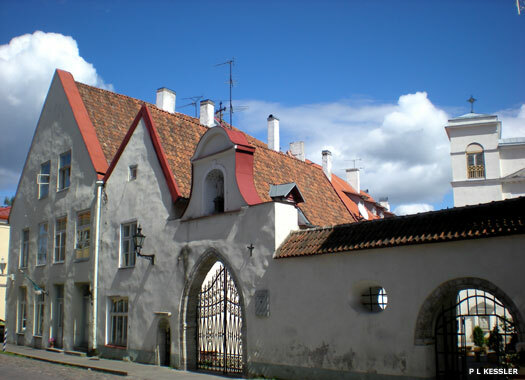 Those of the Wacke family from the late fourteenth century are on public display at Kohtu 6 on Toompea. 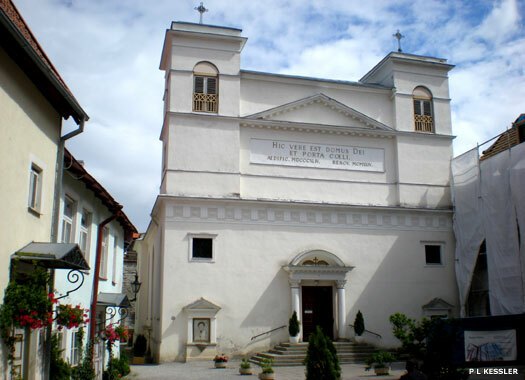 The Roman Catholic Cathedral of St Peter and St Paul is on Vene street, although the term 'cathedral' is not always applied to it, with some referencing it only as a church. It was built over the ruins of the refectory that was part of the Dominican Friary which itself was established on the same site in the thirteenth century. The friary was destroyed by the fire of 1531 which also destroyed the neighbouring St Catherine's Church. The interior of this pseudo-Gothic replacement, with its neo-Classical facade, was completed in 1845. The remains of part of the former friary walls were rebuilt around the new cathedral. In recent years several changes have been made inside the cathedral in order to add more dignity to its outside appearance, including the addition of stained glass windows. The cathedral has four big lancet windows on the southern side and five more on the northern side. The windows on the southern side of the building open on the inner courtyard of the former Dominican monastery. The altar painting in the church, which is entitled 'The Ascension of Virgin Mary', is a gift from Bavarian King Ludwig I (1825-1848). Two doors down from the entrance to the cathedral is this building (in white). 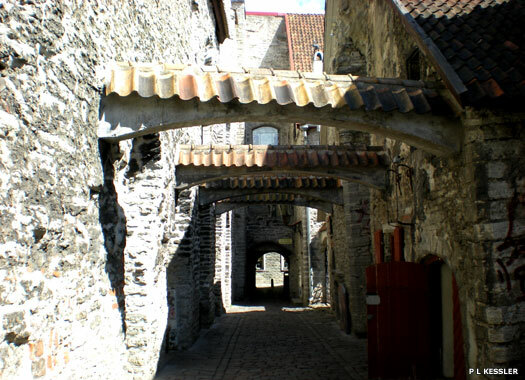 As mentioned in the text for St Catherine's Church, it used to be a storeroom for the Dominican friary, and now it serves as a restaurant, while the Dominican friary itself used to be located behind it and to the left of this photo, with St Catherine's to the right, down the narrow passage.